Friction welding is technology that metals to be bonded are rubbed against each other at high speed and at high pressure to generate friction heat, which softens and bonds the members by metallurgically fusing atoms. 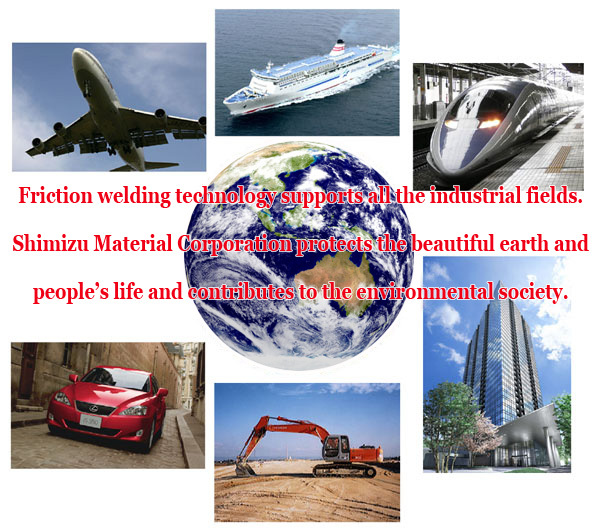 Comparing with conventional arc welding and gas welding*, this is an environmentally friendly bonding method because no heat source other than friction heat is required, no welding rod or flux is required, and no gas or spatter is produced during the bonding. Currently this method is widely introduced to various industrial fields (automobiles, railroad vehicles, ships, industrial machines, etc.). *As for bonding of the automotive rear axle housing, the change from arc welding to friction welding enables reduction of CO2 by about 47%. Capable of bonding different types of metals. Capable of bonding deformed materials. High mechanical strength of bonded section. No special machining such as grooving is required prior to bonding. High dimensional accuracy of bonded product. Capable of saving materials and reducing man-hour. 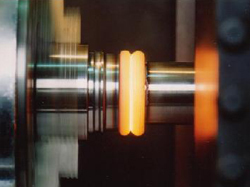 Friction welding automatically performed has high reliability and reproducibility. Weight of heavy product can be reduced by adopting hollow structure. 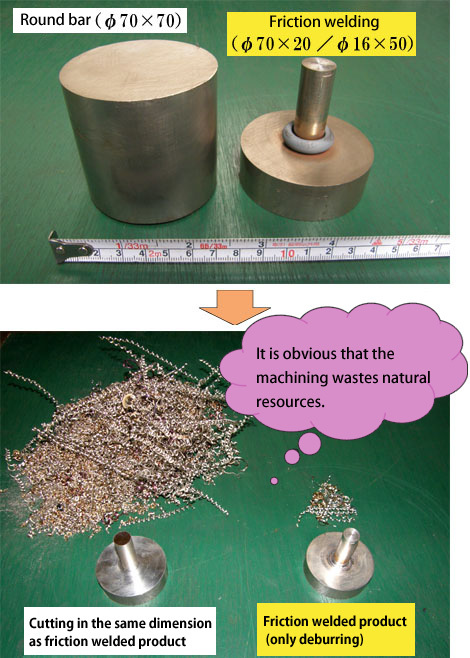 (9) Bonding quality	 Good reproducibility and high quality Difficult to completely eliminate pin holes etc.